Service Provider of PVC U Skid Piping Services. Our product range also comprises of PP Socket Fusion, Piping Grid and PP Chemical Tanks. Keeping track with latest market development, we are devotedly engaged in offering PVC U Skid Piping Services. The offered services are delivered under the supervision of experienced professionals who have got vast experience in their respective areas also we charge most competing cost for our respected client. 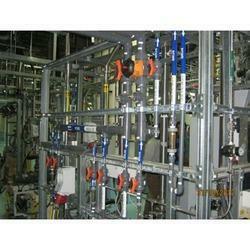 This skid piping is used in various industries like chemical, diary, pharmaceutical and beverage. This piping is recommended for the elimination of undisclosed impurities and suspended solids like heavy metals and dust particles.